Message to attend the King. A BILL for confirming Four private Acts was this Day read the First time. Ordered, That the same be read again, the Second time, on Wednesday next. A Bill for enabling * * Lord Abergavenny to sell Lands, for Payment of Debts, was this Day read the Second time. Resolved, upon the Question, That the same be committed to Mr. Solicitor General, Mr. Vice Chamberlain, Sir Wm. Doyley, Sir Rich. Onslow, Sir Clem. Throgmorton, Mr. Lowther, Mr. Thurland, Sir Tho. Fanshaw, Mr. Wm. Sandys, Sir Edw. Branham, Mr. Clifton, Sir Tho. Woodcook, Sir Antho. Irby, Sir Jo. Hotham, Mr. Morton, Mr. Early, Sir Jo. Covet, Mr. Attorney of the Duchy, Mr. Seymour, Mr. Prin, Mr. Vaughan, Mr. Spencer, Mr. Jonathan Trelawney, Mr. Jo. Trelawney, Mr. Rigby, Sir Cha. Harbord, Mr. Broom Whorwood, Mr. Knight, Mr. Tulse, Mr. Ducket, Mr. Secretary Moris, Mr. Comptroller, Mr. Yorke, Sir Bain. Throgmorton, Sir Sol. Swale, Sir Richard Everard, Mr. Churchill, Sir Tho. Fanshaw jun. Colonel Sandis, Sir Geo. Reeve, Mr. Clifford, Sir Jo. Strangwayes, Sir Cha. Cornwallis, Sir Jo. Holland, Mr. Tompkins, Mr. Washington, Lord Ancram, Sir Rich. Braham, Sir Tho. Leigh, Mr. Chetwind, Sir Rich. Ingolsby, Lord Le De Spencer, Mr. Sam. Trelawney, Mr. Chichley, Sir Tho. Dolman, Mr. Herbert, Mr. Jay, Mr. Crouch, Mr. Wm. Mountague, Mr. Edw. Phillips, Mr. Geo. Mountague, Mr. Walden, Mr. Milward, Mr. Wm. Coventry, Sir Hum. Winch, Sir Geo. Sandys, Mr. Jeffery Palmer, Sir Jo. Goodrick, Sir Robert Atkins, Sir Hen. North, Mr. Giles Strangwayes, Mr. Mallet, Mr. Ashburnham, Sir Henry Newton, Mr. Puckering, Sir Jo Holland, Mr. Daniell, Mr. Collins, Mr. Hen. Coventry, Mr. Tho. Coventry, Lord Breveton, Mr. Lewis Palmer, Sir Wm. Lewis, Mr. Goodrick, Mr. Clerk, Sir Jo. 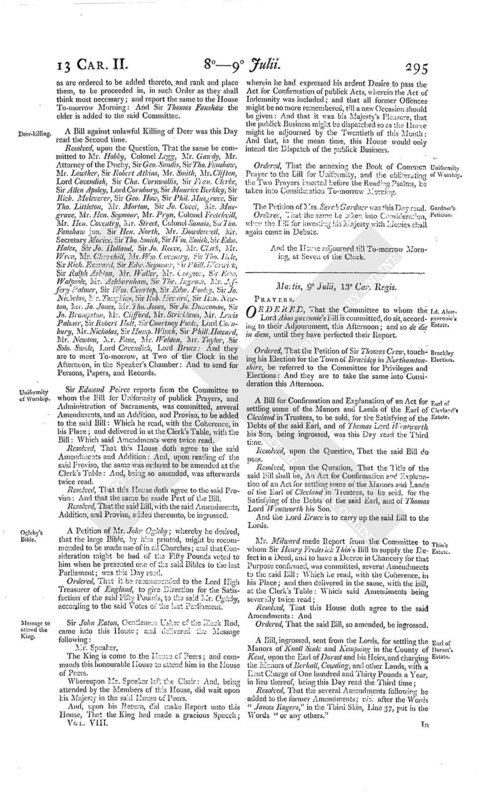 Strangwayes, Mr. Morice, Sir Robert Howard, Mr. John Newton, Mr. Faine, Mr. Taylor, and all the Members of this House that serve for the Counties of Kent and Sussex: And they are to meet this Afternoon in the Exchequer Chamber: And to send for Persons, Papers, and Records: And to take into Consideration the Petition of Henry Nevill sen. Henry Nevill jun. and Edward Nevill, which was this Day read; and any other Petitions, of the like Nature. Mr. Pryn having made Report from the Committee to whom it was referred to see which of the Bills depending in the House, and which were committed to Committees, were of most Necessity to be proceeded in before the Adjournment. Ordered, That these Bills following be proceeded in; viz. Bills concerning the Duchy Lands of Lancaster and Cornewall. Ordered, That the Bill against killing Deer, this Day read the Second time, and upon the Question committed to a Committee, be added to the abovesaid List; to be proceeded in before the Adjournment. Ordered, That the Bill for confirming publick Acts; and also the Bill for restoring Impropriations, Advowsons, &c. be added to the said List of Bills, to be proceeded in before the Adjournment. Ordered, That the Businesses of the King's Majesty's Revenue be proceeded in, and reported, according to former Order, before the Adjournment. Resolved, That the temporary Bill for the Fens be added to the List of Bills, to be proceeded in before the Adjournment. Ordered, That, after this Afternoon, no Committee do sit on any private Bills, except such as are mentioned in, and by Order added to, the List before mentioned; until the said publick Bills, and private Bills, be dispatched. Ordered, That such Committees as are now ready to make Report of any private Bills to them committed, shall have Liberty to do the same, notwithstanding the foresaid Order. 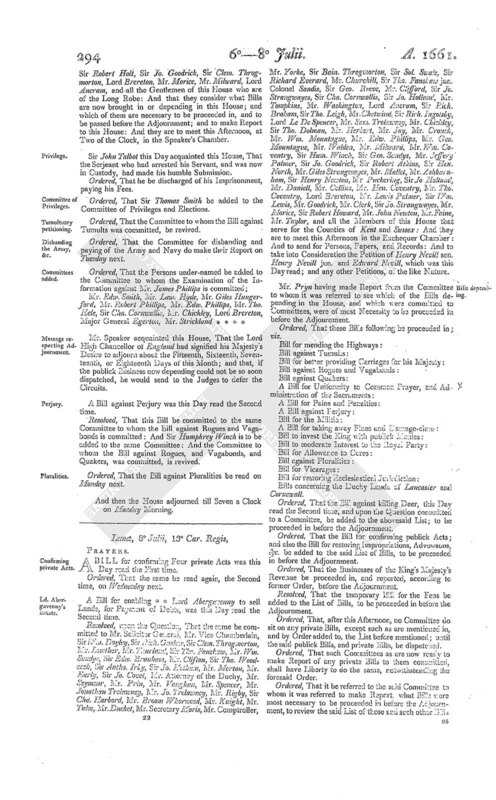 Ordered, That it be referred to the said Committee to whom it was referred to make Report, what Bills were most necessary to be proceeded in before the Adjournment, to review the said List of those and such other Bills as are ordered to be added thereto, and rank and place them, to be proceeded in, in such Order as they shall think most necessary; and report the same to the House To-morrow Morning: And Sir Thomas Fanshaw the elder is added to the said Committee. A Bill against unlawful Killing of Deer was this Day read the Second time. Resolved, upon the Question, That the same be committed to Mr. Hobby, Colonel Legg, Mr. Gawdy, Mr. Attorney of the Duchy, Sir Geo. Sandis, Sir Tho. Fanshaw, Mr. Lowther, Sir Robert Atkins, Mr. Smith, Mr. Clifton, Lord Covendish, Sir Cha. Cornwallis, Sir Fran. Clerke, Sir Allen Apsley, Lord Cornbury, Sir Maurice Berkley, Sir Rich. Maleverer, Sir Geo. How, Sir Phil. Musgrave, Sir Tho. Littleton, Mr. Morton, Sir Jo. Covet, Mr. Musgrave, Mr. Hen. Seymour, Mr. Pryn, Colonel Fretchvill, Mr. Hen. Coventry, Mr. Street, Colonel Sandis, Sir Tho. Fanshaw jun. Sir Hen. North, Mr. Dowdeswell, Mr. Secretary Morice, Sir Tho. Smith, Sir Wm. Smith, Sir Edw. Hales, Sir Jo. Holland, Sir Jo. Reeve, Mr. Clark, Mr. Wren, Mr. Churchill, Mr. Wm. Coventry, Sir Tho. Isle, Sir Rich. Everard, Sir Edw. Seymour, Sir Phill. Warwick, Sir Ralph Ashton, Mr. Waller, Mr. Coryton, Sir Edw. Walpoole, Mr. Ashburnham, Sir Tho. Ingram, Mr. Joffery Palmer, Sir Wm. Courtop, Sir Edm. Pooley, Sir Jo. Nicholas, Mr. Tompkins, Sir Rob. Howard, Sir Hen. Newton, Mr. Jo. Jones, Mr. Tho. Jones, Sir Jo. Duncombe, Sir Jo. Brampston, Mr. Clifford, Mr. Strickland, Mr. Lewis Palmer, Sir Robert Holt, Sir Courtney Poole, Lord Cornbury, Mr. Nicholas, Sir Hump. Winch, Sir Phill. Howard, Mr. Newton, Mr. Fane, Mr. Walden, Mr. Taylor, Sir Solo. Swale, Lord Cavendish, Lord Bruce: And they are to meet To-morrow, at Two of the Clock in the Afternoon, in the Speaker's Chamber: And to send for Persons, Papers, and Records. Sir Edmond Peirce reports from the Committee to whom the Bill for Uniformity of publick Prayers, and Administration of Sacraments, was committed, several Amendments, and an Addition, and Proviso, to be added to the said Bill: Which he read, with the Coherence, in his Place; and delivered in at the Clerk's Table, with the Bill: Which said Amendments were twice read. Resolved, That this House doth agree to the said Amendments and Addition: And, upon reading of the said Proviso, the same was ordered to be amended at the Clerk's Table: And, being so amended, was afterwards twice read. Resolved, That this House doth agree to the said Proviso: And that the same be made Part of the Bill. Resolved, That the said Bill, with the said Amendments, Addition, and Proviso, added thereunto, be ingrossed. A Petition of Mr. John Ogleby; whereby he desired, that the large Bible, by him printed, might be recommended to be made use of in all Churches; and that Consideration might be had of the Fifty Pounds voted to him when he presented one of the said Bibles to the last Parliament; was this Day read. Ordered, That it be recommended to the Lord High Treasurer of England, to give Direction for the Satisfaction of the said Fifty Pounds, to the said Mr. Ogleby, according to the said Votes of the last Parliament. The King is come to the House of Peers; and commands this honourable House to attend him in the House of Peers. Whereupon Mr. Speaker left the Chair: And, being attended by the Members of this House, did wait upon his Majesty in the said House of Peers. And, upon his Return, did make Report unto this House, That the King had made a gracious Speech; wherein he had expressed his ardent Desire to pass the Act for Confirmation of publick Acts, wherein the Act of Indemnity was included; and that all former Offences might be no more remembered, till a new Occasion should be given: And that it was his Majesty's Pleasure, that the publick Business might be dispatched so as the House might be adjourned by the Twentieth of this Month: And that, in the mean time, this House would only intend the Dispatch of the publick Business. Ordered, That the annexing the Book of Common Prayer to the Bill for Uniformity, and the obliterating the Two Prayers inserted before the Reading Psalms, be taken into Consideration To-morrow Morning. The Petition of Mrs. Sarah Gardner was this Day read. Ordered, That the same be taken into Consideration, when the Bill for investing his Majesty with Monies shall again come in Debate. And the House adjourned till To-morrow Morning, at Seven of the Clock.